^ Burnes, William. The Burns Encyclopedia. [2011-04-25]. ^ Robert Burns 1759 – 1796. The Robert Burns World Federation. [2011-04-25]. （原始内容存档于2011-09-27）. ^ Mauchline kirk session records, National Archives of Scotland. 'The Legacy of Robert Burns's feature on the National Archives of Scotland website. National Archives of Scotland. 1 July 2009 [2009-07-21]. ^ 7.0 7.1 Highland Mary (Mary Campbell). Famous Sons and Daughters of Greenock. Nostalgic Greenock. [17 January 2010]. （原始内容存档于2008年8月21日）. 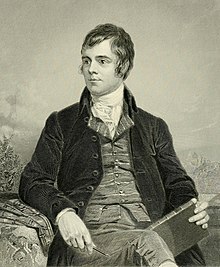 ^ Feature on The Poet Robert Burns. Robert Burns History. Scotland.org. 13 January 2004 [2009-06-10]. （原始内容存档于2009年2月27日）. ^ Folkin' For Jamaica: Sly, Robbie and Robert Burns. The Play Ethic. 1 January 2009 [2009-06-10]. ^ 13.0 13.1 Hogg, PS (2008). Robert Burns. The Patriot Bard. Edinburgh : Mainstream Publishing. ISBN 978-1-84596-412-2. p. 321. ^ Testament Dative and Inventory of Robert Burns, 1796, Dumfries Commissary Court (National Archives of Scotland CC5/6/18, pp. 74–75). ScotlandsPeople website. National Archives of Scotland. [21 July 2009]. ^ Appointment of judicial factor for Robert Burns's children, Court of Session records (National Archives of Scotland CS97/101/15), 1798–1801. 'The Legacy of Robert Burns' feature on the National Archives of Scotland website. National Archives of Scotland. 1 July 2009 [2009-07-21]. Burns, R. Bold, A, 编. Rhymer Rab: An Anthology of Poems and Prose. London: Black Swan. 1993. ISBN 1-84195-380-6. Burns, R. Noble, A; Hogg, PS, 编. The Canongate Burns: The Complete Poems and Songs of Robert Burns. Edinburgh: Canongate Books. 2003. ISBN 1-84195-380-6.